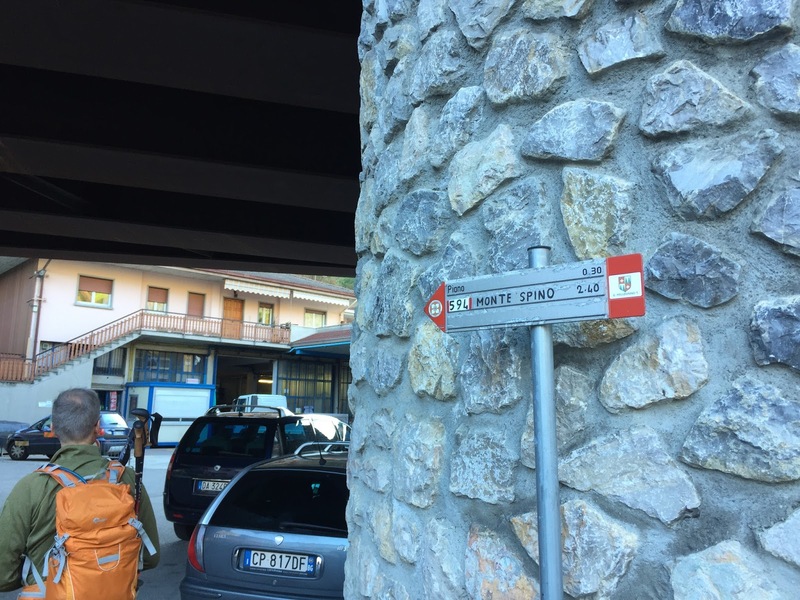 In this installment of street sign language lesion, we visit Crespi D’Adda and Trezzo sull’Adda (for more info see Two Day Trips from Bergamo: Sirmione and Crespi d’Adda) where we encounter signs telling us that we shouldn’t fish in a fish ladder as well as learn where Qui Quo Qua live. Area cimiteriale sign in Crespi d'Adda. 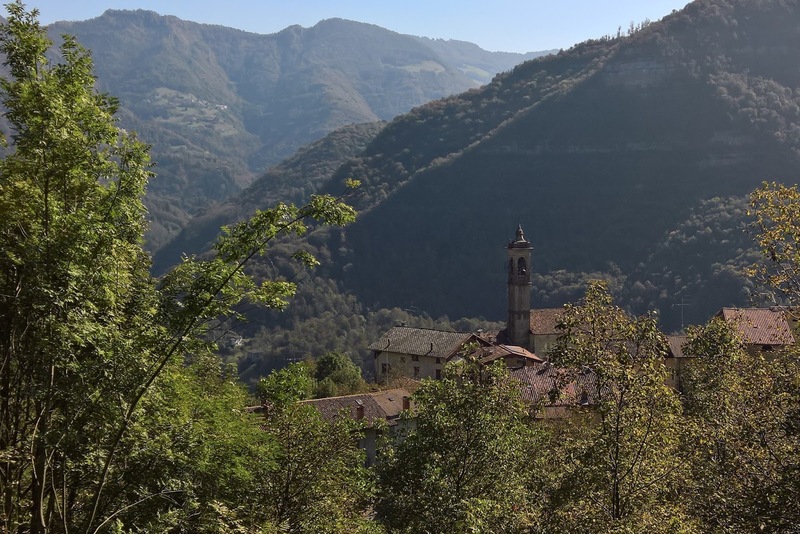 Crespi d’Adda is a factory town southwest of Bergamo, located on the Adda River. 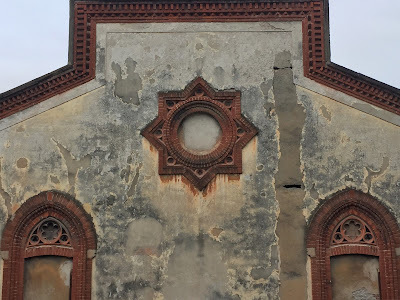 The factory is now closed, but during its run from the late 1800's to 2003, the factory owners provided workers with more than just a place to work: they also provided houses, a school, a church, a cemetery and other services you might find in a typical town. The cemetery is located at the south end of town. The sign was posted on the road to the cemetery. 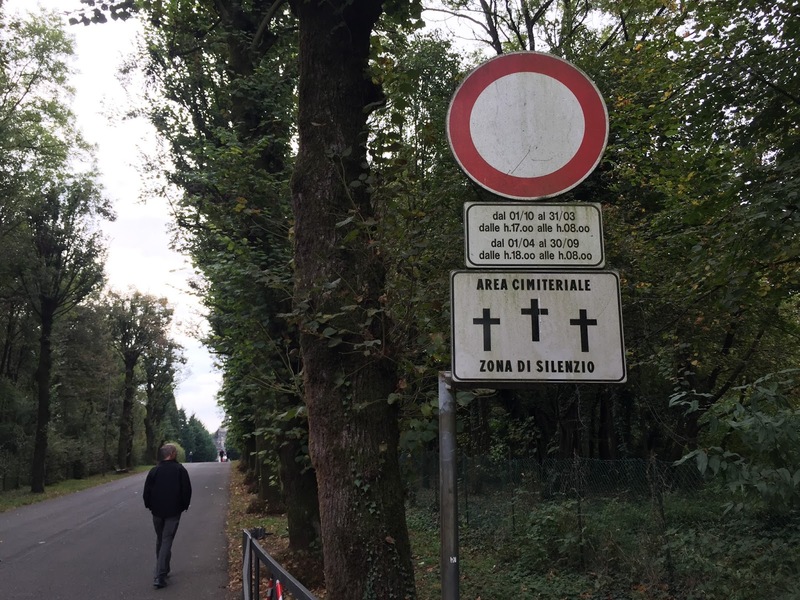 Use of area cimiteriale suggests you should be quiet not only inside the cemetery but outside as well. 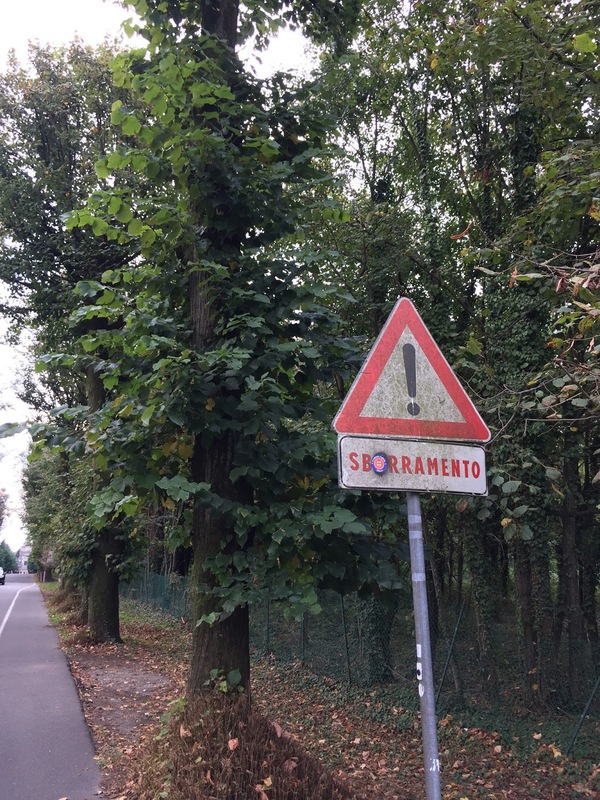 On the street to the Crespi d’Adda cemetery, this sign warns of an upcoming barrier. After certain hours, a gate closes on the road leading to the cemetery. The interesting thing with this sign is that it appears that someone spray painted an “o” over the “a” making it sborramento, which is related to the verb sborrare, the verb to ejaculate. The subtle change gives a whole new meaning to the exclamation point ! in the sign. 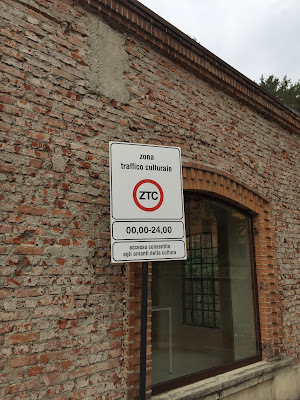 ZTC - zona traffico cultrale sign in Crespi d'Adda. 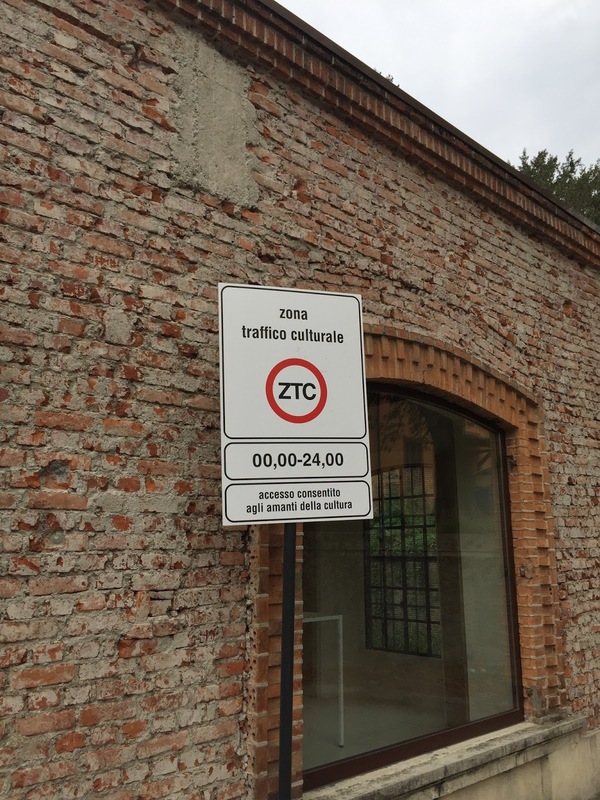 This is variation on the common ZTL (zona a traffico limitato) sign you see typically in historic city centers. Here ZTC tells you tongue-in-cheek that you’ll be getting some culture, proceed with caution. And, this ZTC is enforced 24 hours a day! The sign further continues with accesso consentito agli amanit della cultura - access allowed for lovers of culture. We saw this sign at the Crespi d’Adda information center. 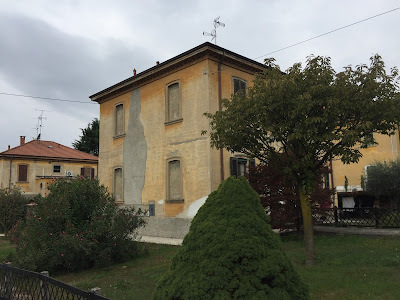 Qui Quo Qua houses on Trezzo sull'Adda. We walked from Crespi d’Adda to Trezzo sull’Adda along the river and took this photo just before reaching the Taccani Hydroelectric plant. 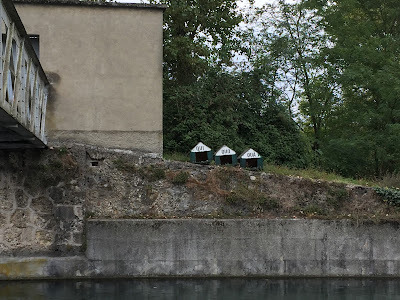 The photo is of three little houses. We wondered what or who could they be for? Answer: Qui, Quo, and Qua are what Italians call Huey, Dewey, and Louie, the triplet nephews of Donald Duck (who is called Paperino). These Disney ducks are quite popular in Italy. 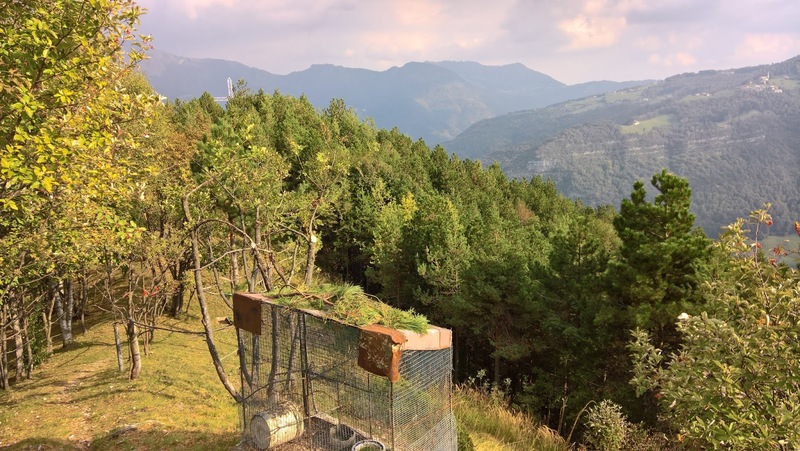 Non buttate niente nel canale (Trezzo sull'Adda). This canal / lock allows boats to navigate a level change in the Adda River that occurs at the bend in the river where hydraulic power is generated. In Italian, a lock is can be referred to as just canale, or conca idraulica, or conca di navigazione. Instead of non buttare for single person informal you command, they chose the plural you'all, non buttate. Maybe they are addressing Qui, Quo and Qua. What keeps me up at night with this sign is how they did it. Did they write it upside down, hanging over the edge? Or did they write it from inside a boat? Left: No fishing in the fish ladder. Right: Parco Adda Nord - passaggio artificiale per pesci sbarramento (that word again!) Italgen. Context is important here: this a sign is on the side of a fish ladder on the River Adda. 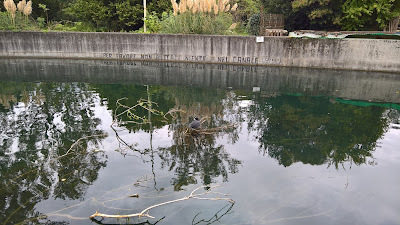 No fishing in the fish ladder or you'll have to answer to Qui, Quo and Qua. Left: Water cleaning / filtering mechanism at the Taccani Hydroelectric plant. Basically the sign says: don't touch! Right: The Taccani plant. 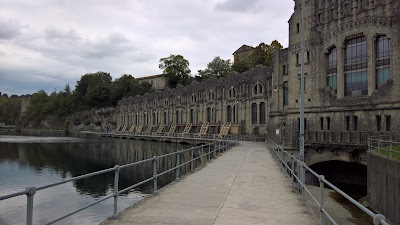 The Centrale idroelettrica Taccani, or Taccani Hydroelectric plant, was built in the late 1800s with the specific visual goal to not contrast with the remains of the Visconteo castle (Castello di Trezzo sull’Adda) that sits above it. 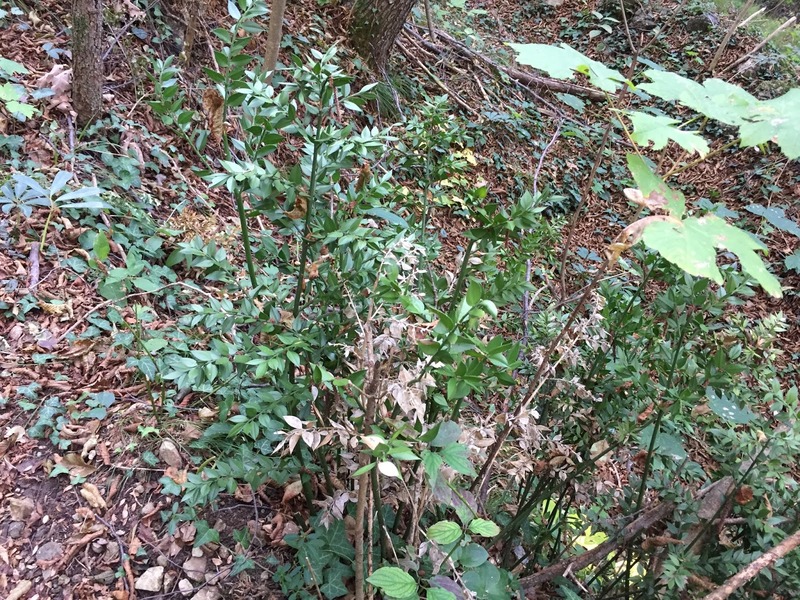 This was accomplished by using a type of local conglomerate stone called ceppo dell’Adda to make the plant blend in. The same stone was also used in the castle. 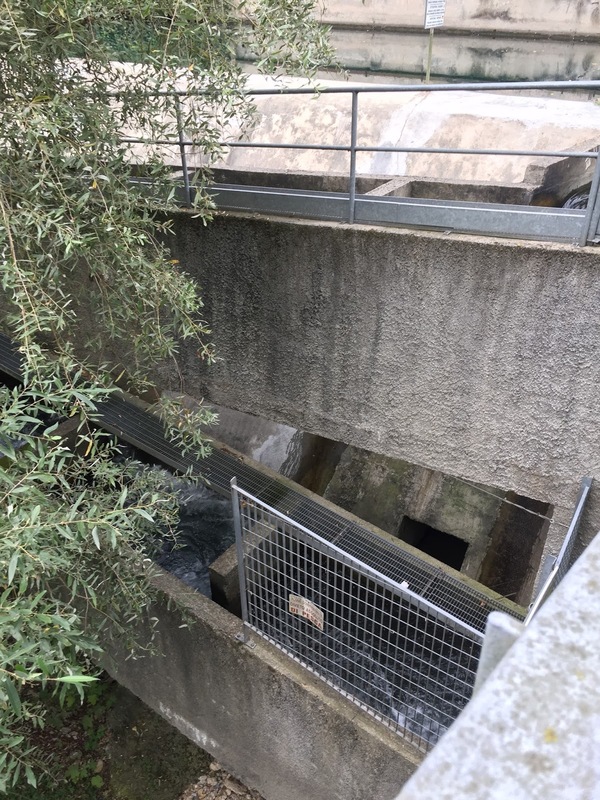 At the water intake points of the plant there are automated mechanisms for removing debris from the water thereby avoiding damage to the turbines. 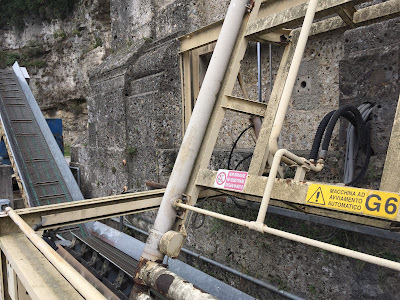 The signs on those mechanisms warn not to attempt to repair or adjust moving parts. The mechanisms start every few minutes, reaching down and scooping up debris from the water and depositing onto a conveyor belt, which transports it away. This type of signage (segnaletica) confuses me: who are the pictographs (pittogrammi) and words (testi) aimed at, me a visitor, a worker at the plant, or both? Left: View through the ruins of the Grotte di Catulla (Sirmione) onto Lago di Garda. 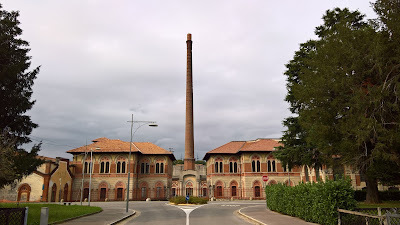 Right: Factory entrance at Crespi d'Adda. Besides the Perché Bergamo?, the next question locals usually ask is if we’ve been to Sirmione or Crespi D’Adda. 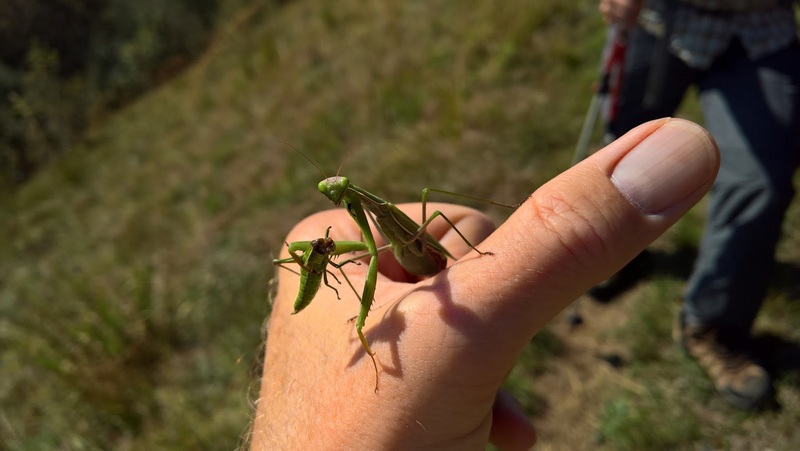 For almost a year we’ve had to say no. But no more because finally this weekend the timing was right and we went to both of these iconic sites. 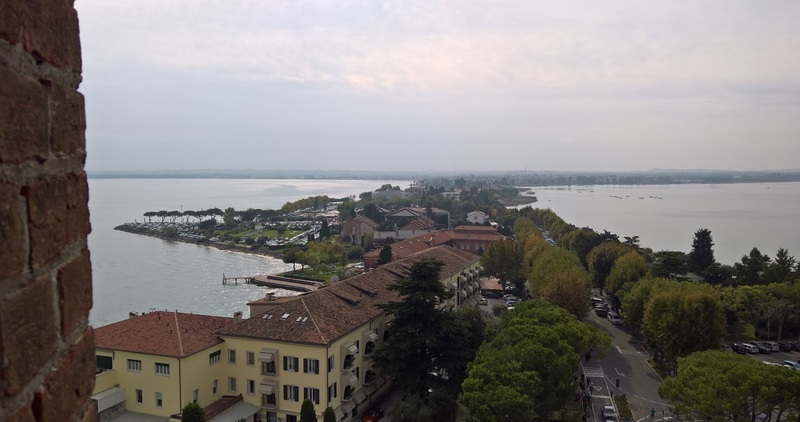 Aside: It is possible to take public transportation to both of these sites: a train and bus combo to Sirmione and a bus to Crespi D’Adda. Instead, we rented a car for the weekend and used that to visit. Sirmione is a little over 1 hour west of Bergamo, and Crespi D’Adda is about 25 minutes southwest of Bergamo. We found parking in Crespi relatively easily. 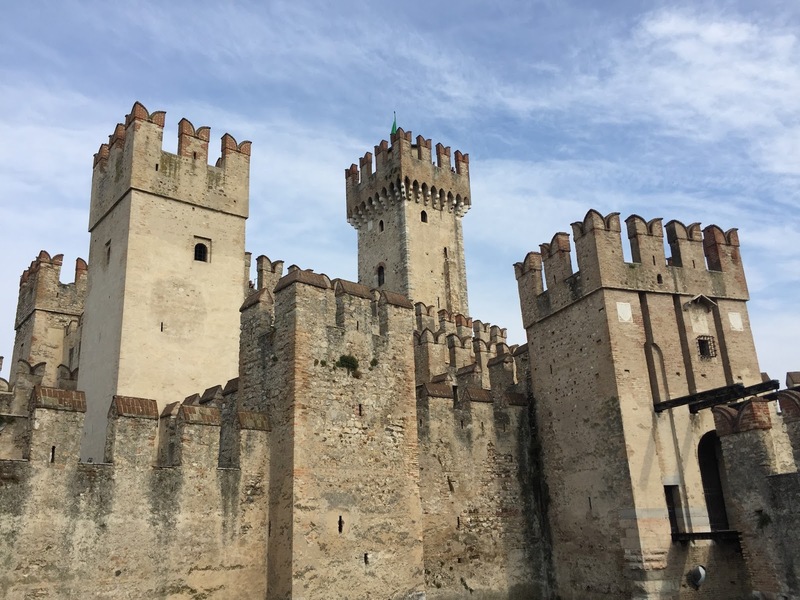 In Sirmione, if you are lucky and the town isn’t busy, you can park just south of the historic center in the large pay lot. If not, you’ll have to park further south along one of the many pay lots and hoof it to the center. 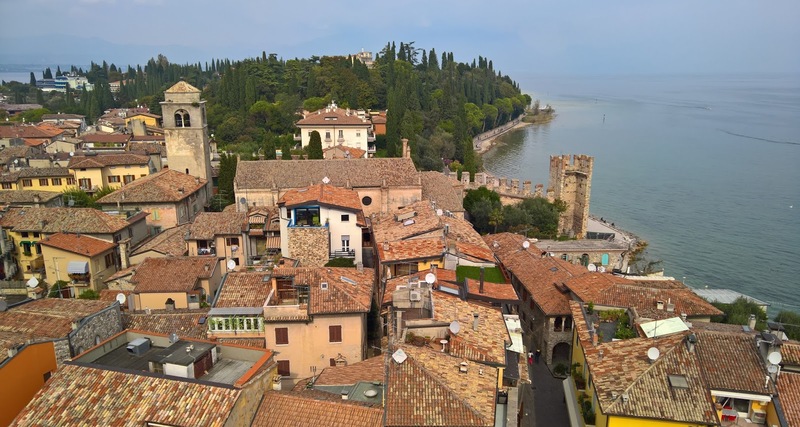 Geographically, Sirmione is a peninsula – a long skinny finger – jutting into Lago di Garda, running north south. 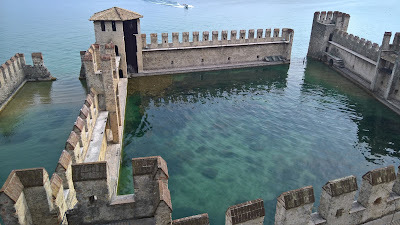 About midway up the peninsula, is the south entrance of the old city, guarded by the photogenic Castello Scaligero. 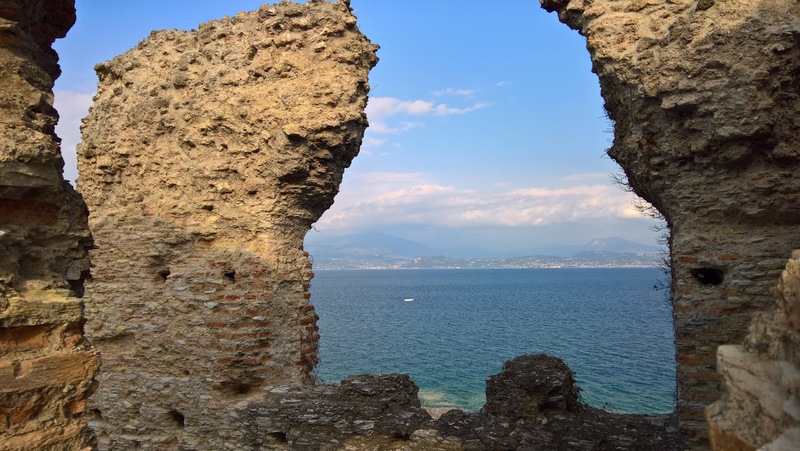 After the castle and continuing north, you pass through shops, restaurants, and large hotels until you reach the Grotte di Catullo, which is the ruins of a large Roman villa at the north end of the peninsula. Along the journey, you are never more than a few steps from the lake. The main attractions for us were the Castello and the Grotte di Catullo. Spas which take advantage of the warm, mineral-rich waters that come out of the natural hot springs of the peninsula are a popular draw as well in Sirmione, but not for us today. We did see a few bathers taking in the “waters” in makeshift spa pools built up of rocks along the shore and profiting from excess hot water released into the lake. 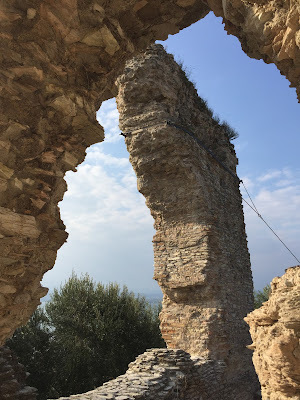 We spent about 1 hour in the Castello, walked a bit, ate lunch (Ristorante Il Girasole), and then tackled the Grotte in the afternoon, a full day. 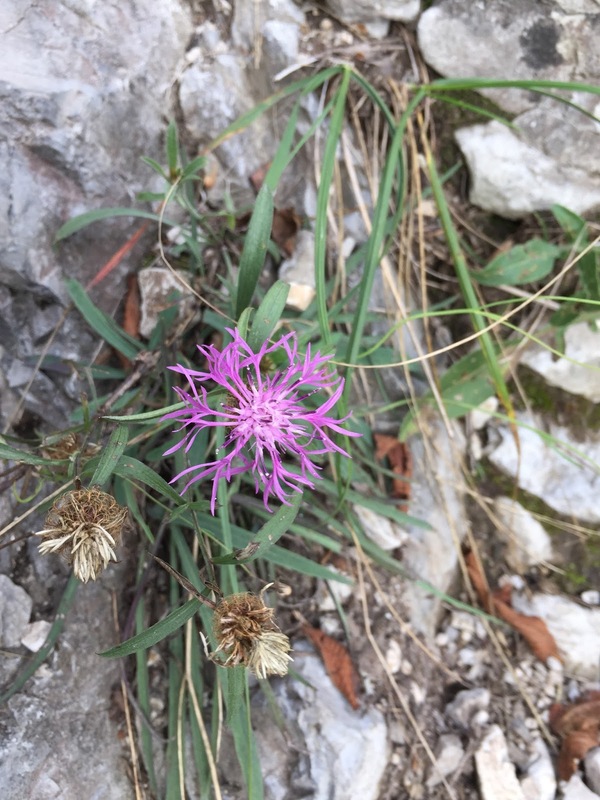 The name grotte in the Grotte di Catullo is not because it really is a grotto, but rather it looked like one when it was discovered. 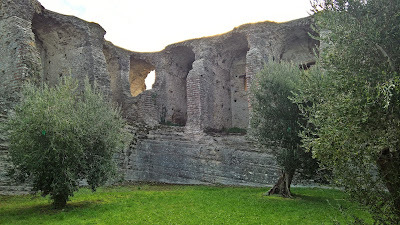 After the complex collapsed, it was slowly reclaimed by the centuries and became covered with vegetation and earth and so took on the appearance of a grotto to those who visited it. 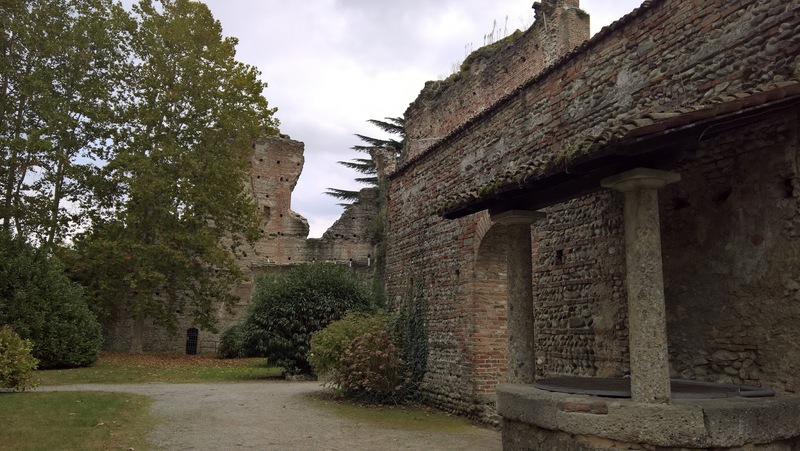 Today, for a small entrance fee, you can visit the ruins of the former villa as well as its small museum. 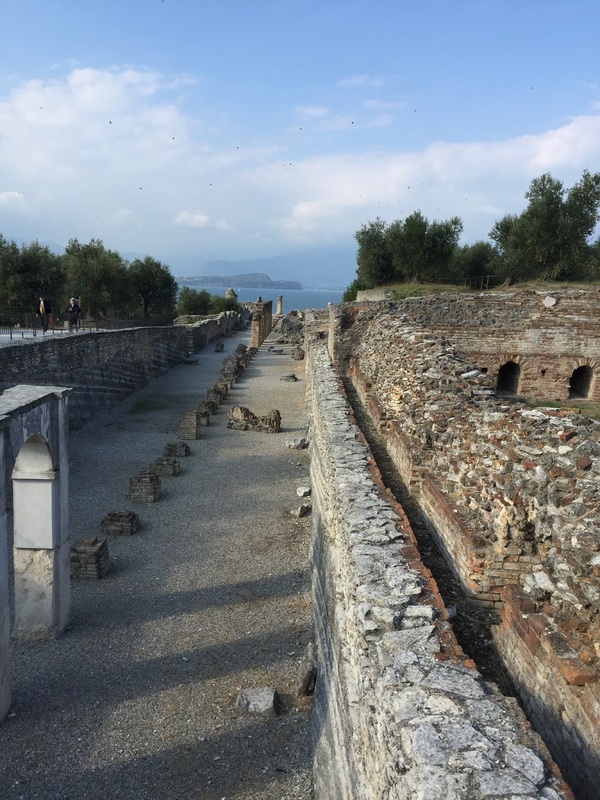 The name Catullo comes from the Roman poet Catullo (Catullus in English). Although it is sometimes written that he was the owner of the villa, according to the museum (see schede didattiche), Catullo only mentioned in a poem that he had a house in Sirmione. 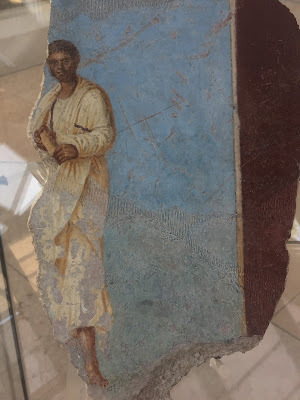 The villa was constructed after his death and the real owners are not known. The Castello Scaligero is named for the family della Scala, a noble family from Verona. Scaligero means of or belonging to the family della Scala. Their family insignia features a ladder (scala). 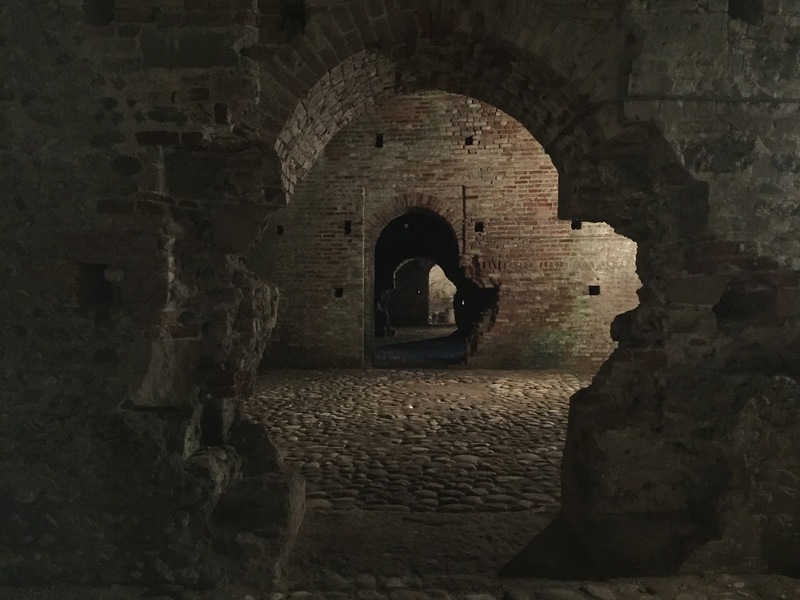 There isn’t anything in the castle to see, but the fun is walking through it and the views from the battlements. 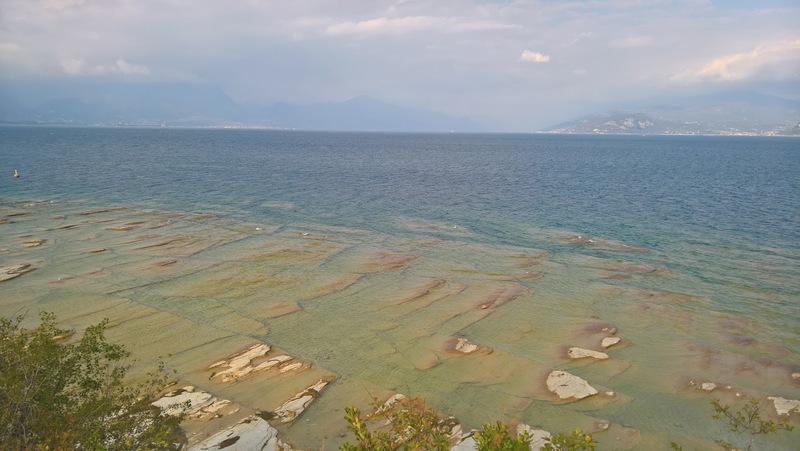 One striking aspect of Sirmione are the surrounding beige limestone beaches. 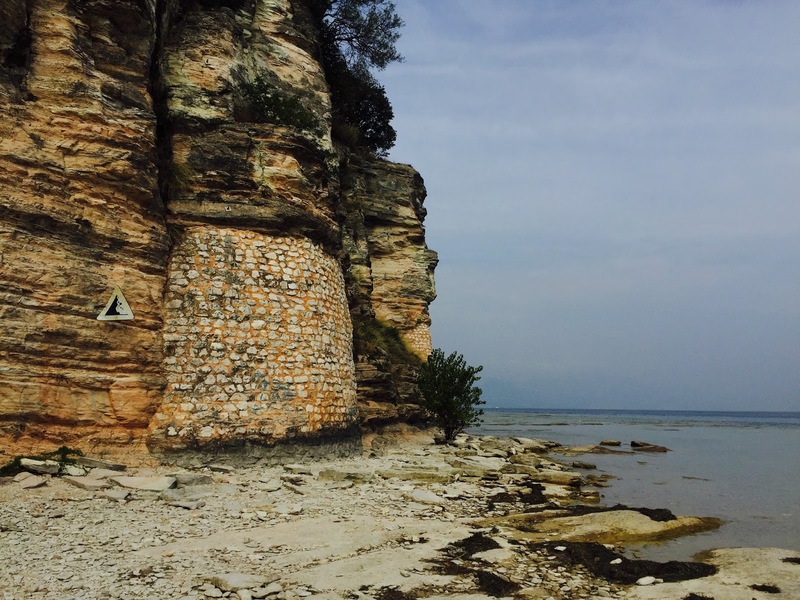 It’s not your classic sandy beach, but rather, flat slabs of stone that make for a unique landscape. 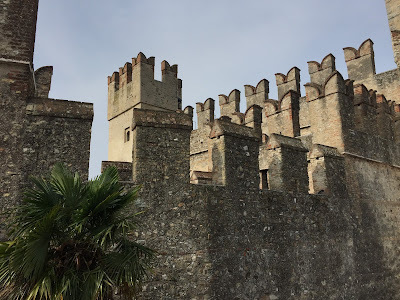 Photos of the Castello Scaligero in Sirmione. Note ghibelline merlons, swallow-tailed shape. 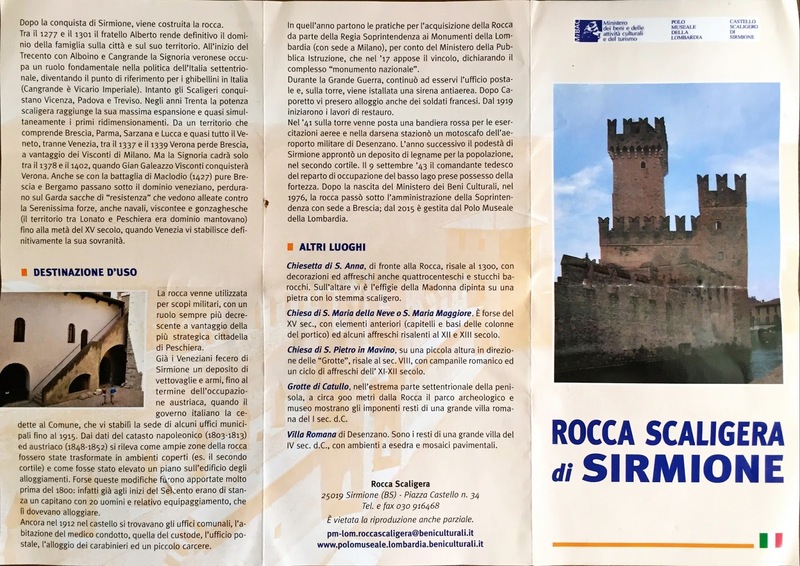 Left and center left: Castello Scaliergo (Rocca Scaligera di Sirmione) brochure. 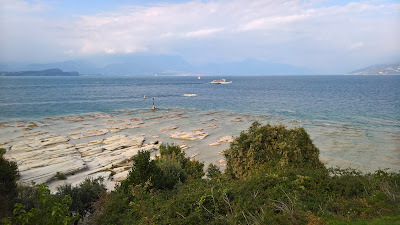 Center right: Shore below Grotte di Catullo. 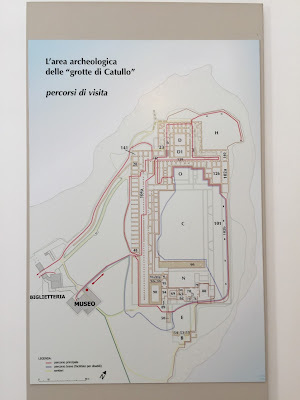 Right: Grotte di Catullo substructure. Left: Arch and substructure in the Grotte di Catullo. Center left: Catullus (English spelling) depicted in a fresco found in the ruins. Center right: West crypto-portico of the villa. 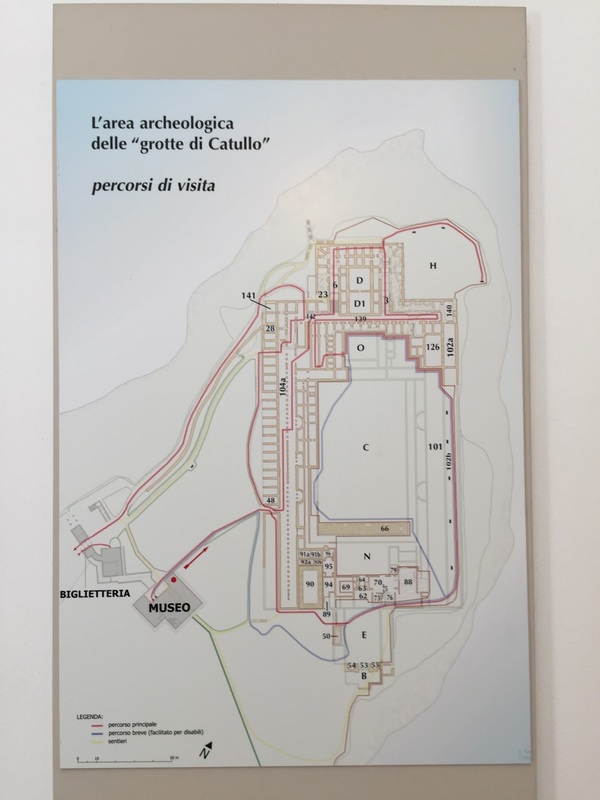 Right: A schematic of the Grotte di Catullo showing paths through the ruins. Left: View of Sirmione looking north from the Castello Scaligero. Right: View of Sirmione looking south from the Castello Scaligero. Limestone rocks around the tip of Sirmione. Crespi d’Adda is a company town along the River Adda, built by the industrialist Cristoforo Benigno Crespi in the late 19th century. The factory there produced textiles, and has been an UNESCO World Heritage Site since 1995. 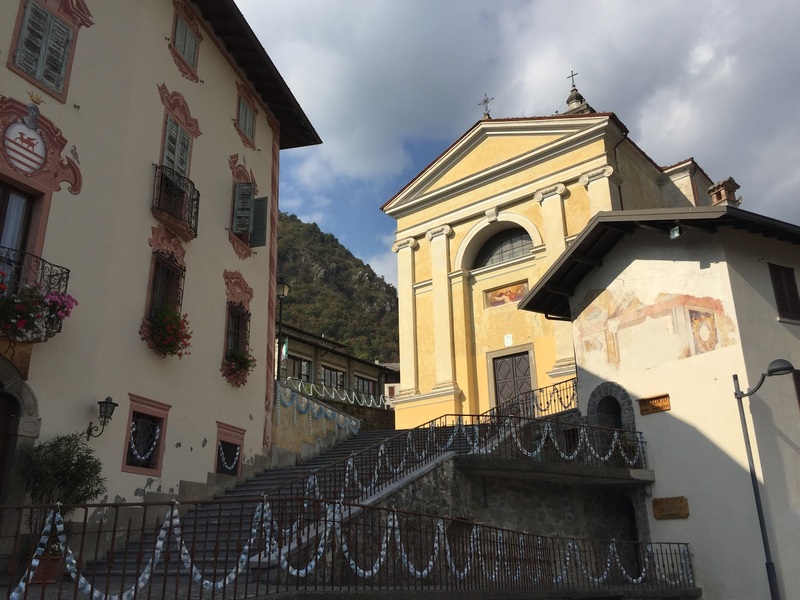 The idea behind Crespi d’Adda was to provide workers with more than just a place to work: the town included housing for workers as well as a school, a church, and other social services. The utopian ideals behind the town endured for a surprising long time, running from the late 1800s until the factory closed in 2003. At first glance, the layout of the town is overly symbolic: the perfect symmetry of the houses of the workers (cassette operaie) on a street near the factory (fabbrica), the positioning of the chaplain’s and doctor’s homes on a hill overlooking the workers’ houses as if keeping watch, the elegant houses (ville) of the factory directors (dirigenti) apart from the workers’ houses, and the Crespi castle-house (castello) apart from the rest, but close to the factory. And to cap it all off, the cemetery is located just down the main street with the oversized mausoleum of Crespi keeping eye on the modest graves of the workers even in death. The cradle to grave approach of Crespi d'Adda seems confining to me, but I have only to think of what other options there would have been for work, education, and a healthy lifestyle at that time, and I can easily convince myself that maybe it wouldn't have been so bad living and working there. The tour we took, one of two offered on Sundays, didn’t include going inside any of the buildings other than an info center carved out of a small part of the factory. So you don’t go into homes (which are all private) nor the factory (which is empty). I sort of expected a peek inside of something. On every other Sunday there is a tour of the hydroelectric plant. The idea behind company towns and “enlightened industrialists” who built them is an interesting one, but was only briefly discussed on the tour. Currently, the factory part of Crespi d’Adda is owned by Peracassi, with plans to relocate their headquarters there. From one enlightened industrialist to another. Stay tuned. 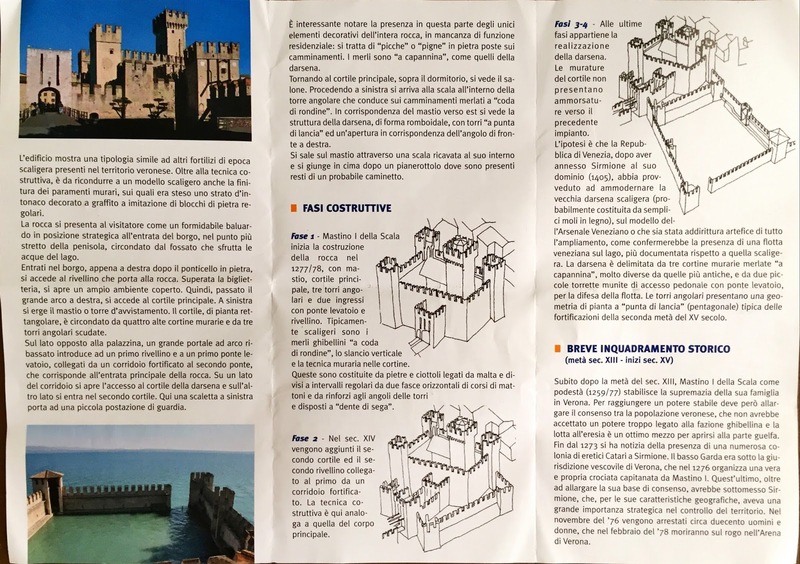 The Crespi d’Adda site is a good source of information, and is provided in several different languages. 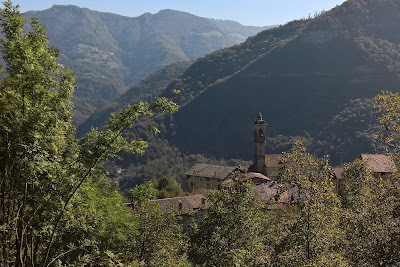 From Crespi D’Adda, we walked to Castello Visconteo (Trezzo D’Adda), about 30 minutes north by foot. 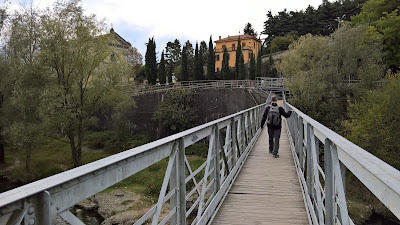 From the northwest edge of the Crespi D’Adda "castle" property, we walked north along east side of the river, crossed over a small foot bridge (location) to get to the west side of the river, and continued north. When you get to the base of the Castello, you can climb a steep road or continue along the river to pass by the centrale idroelettrica Taccani di Trezzo sull’Adda and then loop back around to reach the Castello. 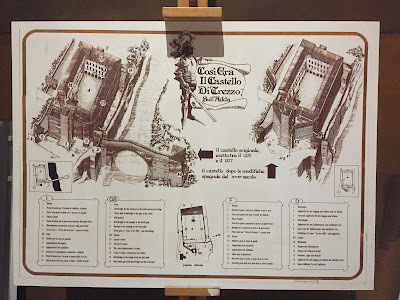 We took the tour of the Castello subterranean and tower for a few euros. Or, you can skip the tour and climb to the top of the tower. The full tour was well worth it. For more information about itineraries along the Adda River starting from Crespi d’Adda, see Itineraries on the Crespi d’Adda site. Left: The characteristic emblem of Crespi d'Adda, an 8 sided star with a circle inscribed inside. Right: Example of a worker's house. North and south windows were often fake or closed with most openings on the east and west sides. Left: Foot bridge across the Adda River near Crespi d'Adda. 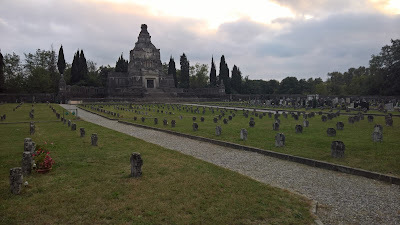 Right: The cemetery at Crespi d'Adda. 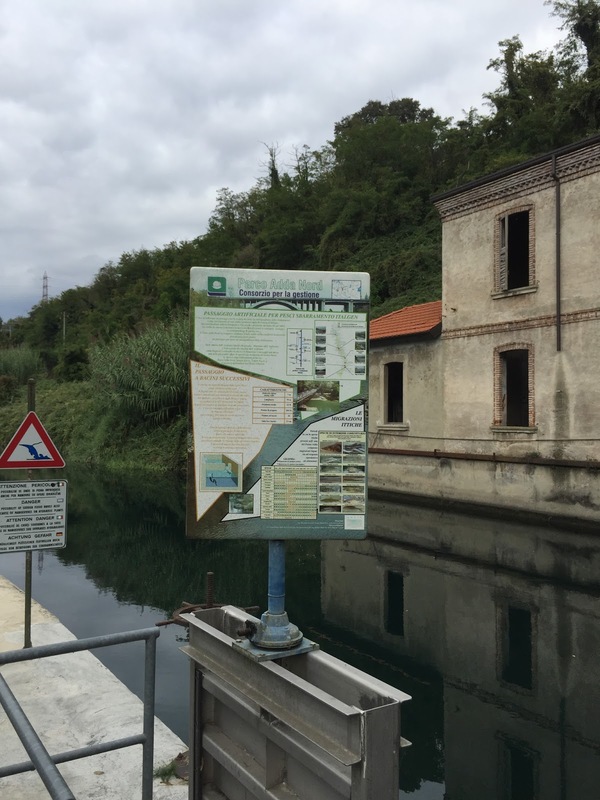 Left: The Taccani Hydroelectric plant at Trezzo sull'Adda. 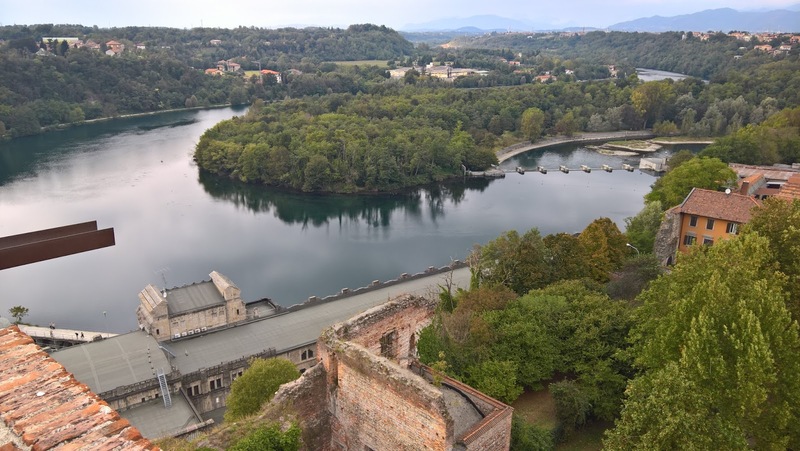 Right: Above the hydroelectric plant are the ruins of Castello Visconteo. 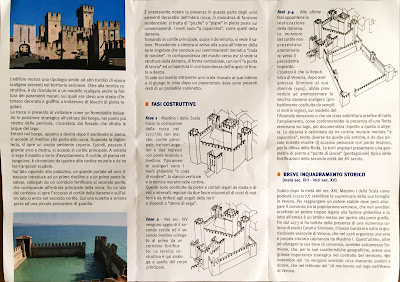 Left: Dungeon of Castello Visconteo. 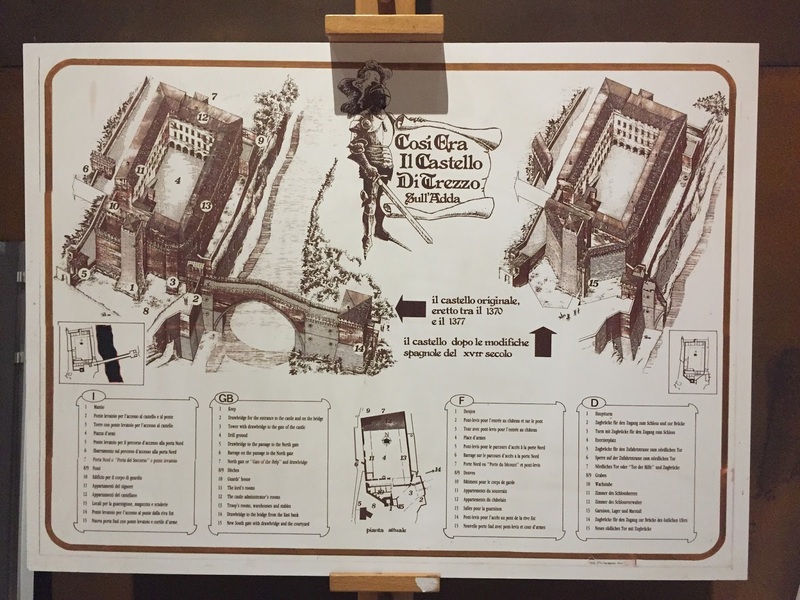 Center: A map of the Castello Visconteo (Trezzo sull'Adda). 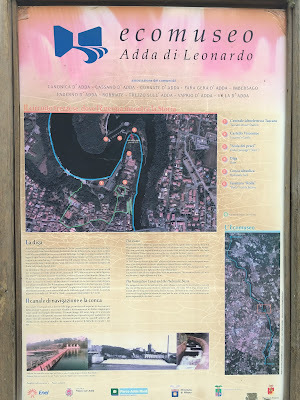 Right: A sign explaining the open-air museum along the Adda River: Ecomuseo Adda di Leonardo. 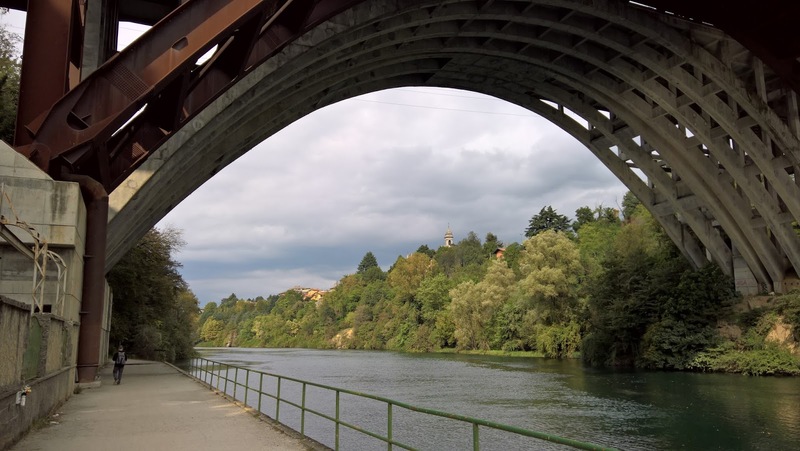 Left: Walking on the west side of the Adda River, under the A4 Autostrada, on the way to Trezzo sull'Adda. 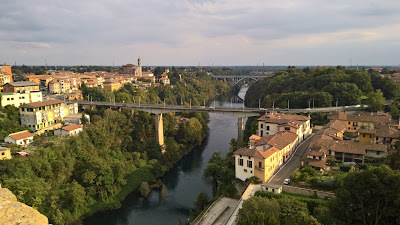 Right: View from the Castello Visconteo south back along the Adda River. 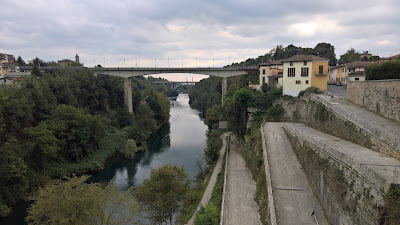 Left: View from the Castello Visconteo tower down on to the Taccani Hydroelectric plant and the bend in the Adda River near Trezzo sull'Adda. Right: View from the Castello Visconteo tower looking south toward Crespi d'Adda (two smoke stacks of the factory are visible in the distance). 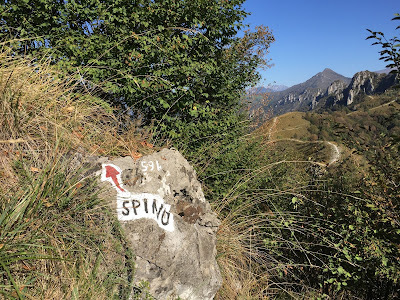 Left: Hiking route from San Pellegrino to Pizzo di Spino and Bracca. 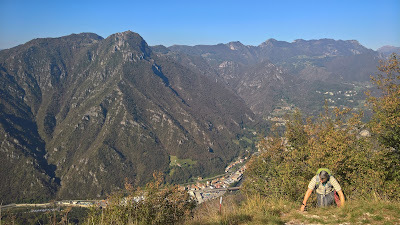 Right: On the spine of the hill near Pizzo di Spino, view north of the Bergamasque Prealps. 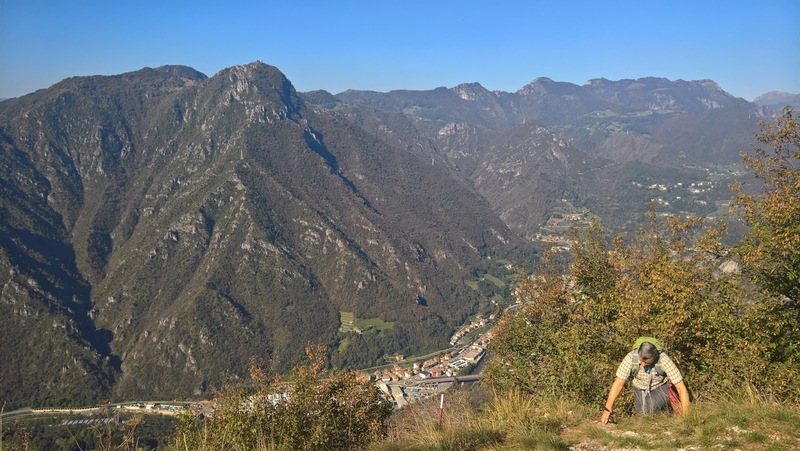 This hike was born by us flipping through the Osteria d'Italia book and observing that in Bracca (BG) there is the recommended Trattoria Dentella. At that point, it was then a matter of finding a route there so we could work up our appetites. After a little poking around on the very useful CAI Bergamo site, we figured that Sentiero 594 circuit route would do the trick, with a little side trip on Sentiero 597. 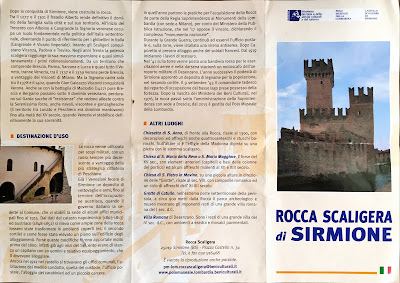 Aside: We use the Bergamo Trasporti site to figure out bus routes and times to and from Bergamo. 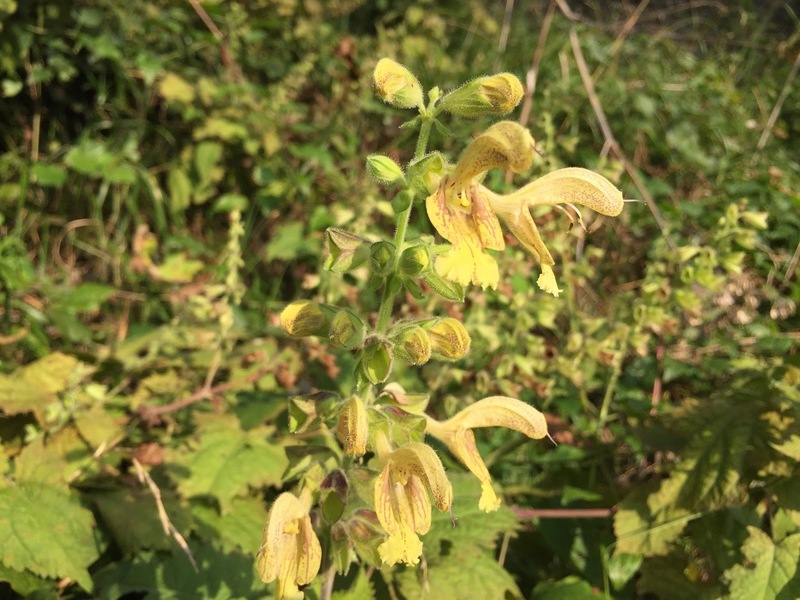 The trick to using the site is to find the names of key bus stops in the town you are interested in, and then make sure you select that as your destination. For example, on Google Maps, if you zoom in far enough you'll see bus station icons. Clicking a bus station icon shows the name of the bus stop. That name will be useful when using the Bergamo Trasporti site. Sentiero 594 is a loop trail with two ends of the trail based in Ruspino (just south of San Pellegrino). 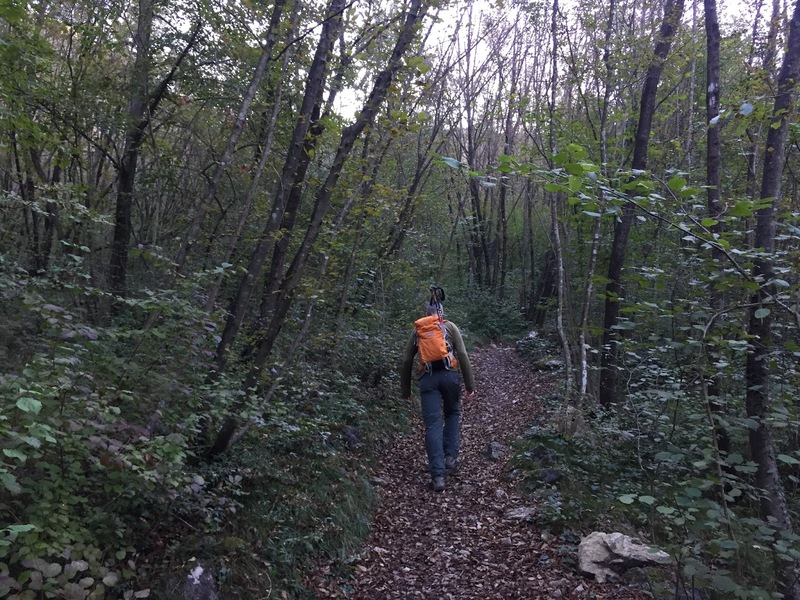 We went counter-clockwise on the trail, heading south to Pizzo di Spino and then turning north again toward Bracca. 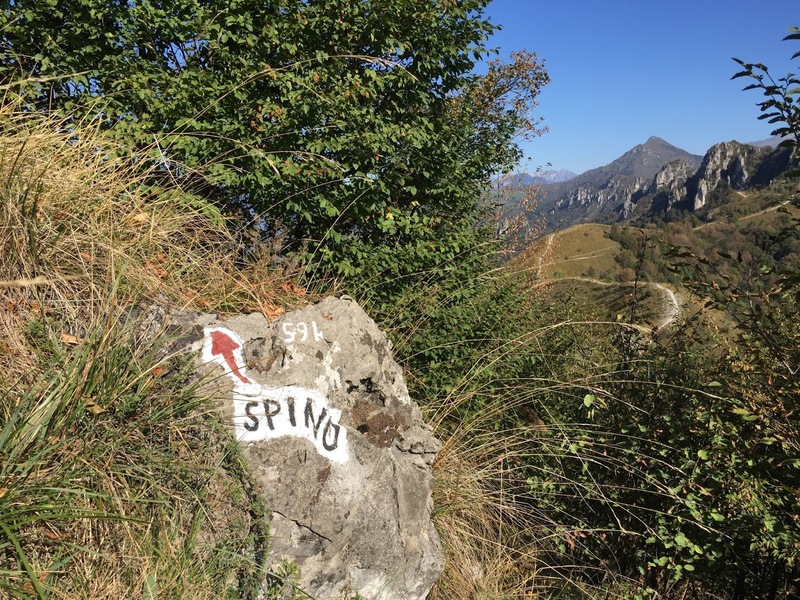 On the first 1/5 of the trail you hear the noise of the San Pellegrino bottling plant. You don't escape that noise until you hit Sottoripa (area under Pizzo Spino). 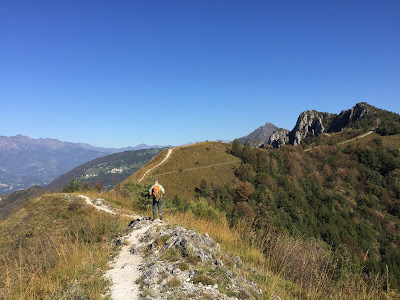 The trail to Pizzo di Spino (last 200-300 m) was pretty steep. 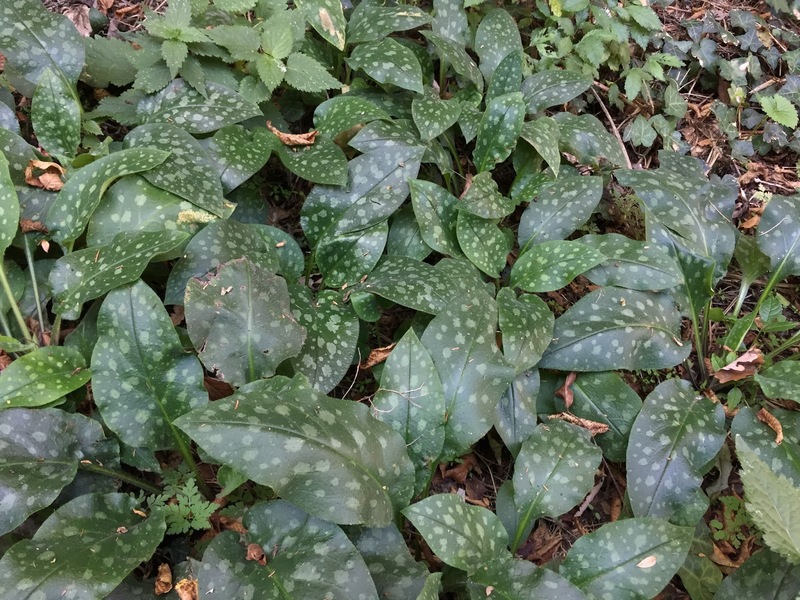 I was glad we were climbing and not descending. 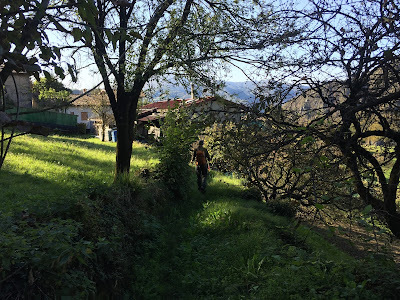 You can avoid that bit of trail by talking Sentiero 594A (alternative) toward Pregaroldi. 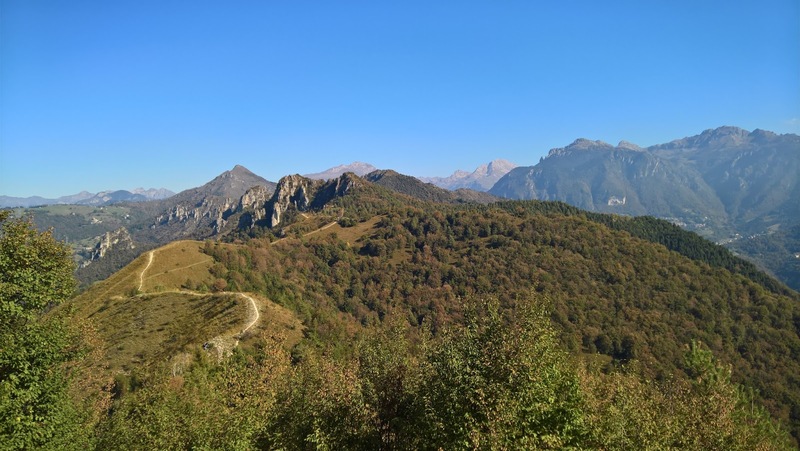 The best part of the trail is walking from Pizzo di Spino north along Sentiero 594. To me, it's the essence of the hill walks around Bergamo. You walk on a spine with great views down into adjacent valleys. 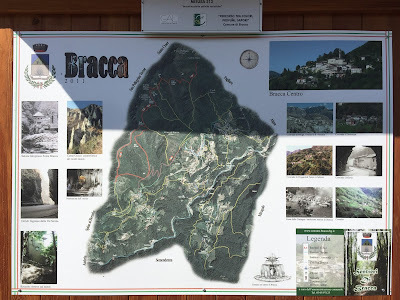 Left: Information board showing different hiking routes around Bracca including CAI (red) and local (yellow) trails. Center: Bracca church. 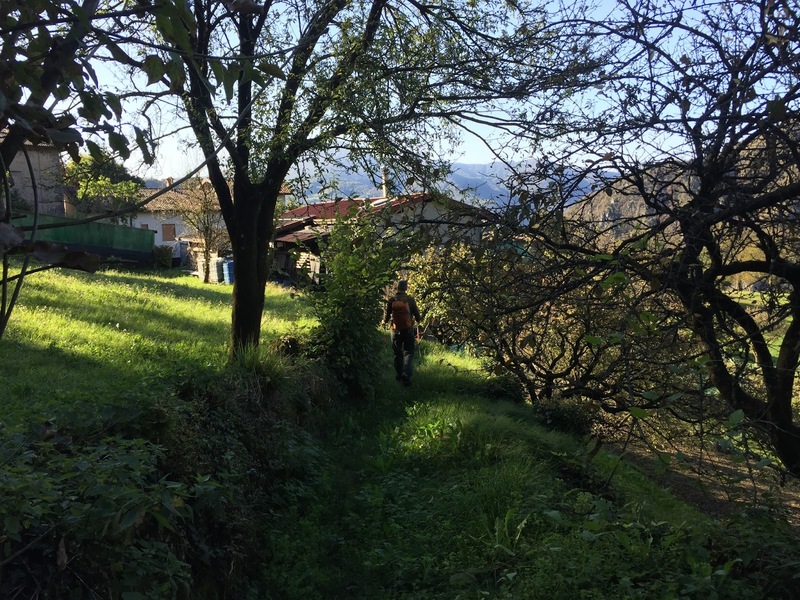 Right: View as Sentiero 597 descends into Bracca. 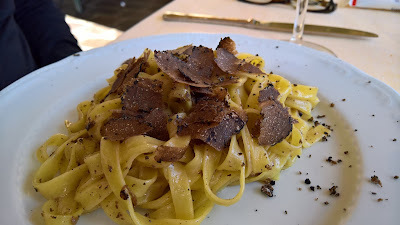 Several dishes at Trattoria Dentella (Bracca) with local black truffle that we tried. 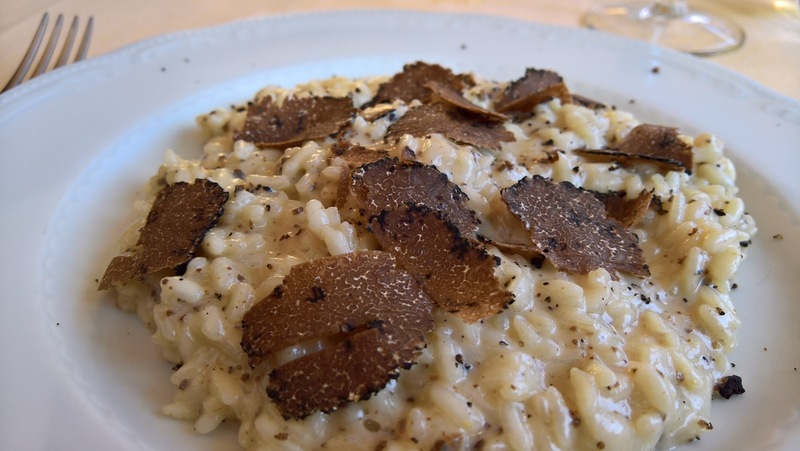 Left: Risotto. Center: Tagliatelle fresca con tartufo nero. 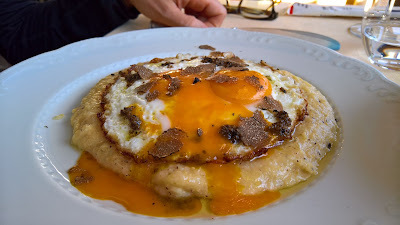 Right: Uovo al tegamino con grattata di tartufo nero con polenta. Left: Astrantia major. 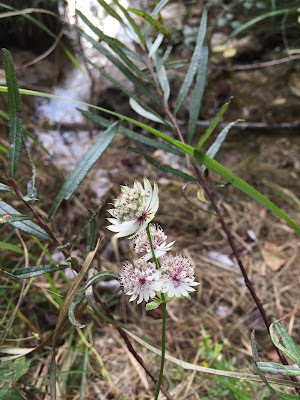 Center: Centaurea uniflora. 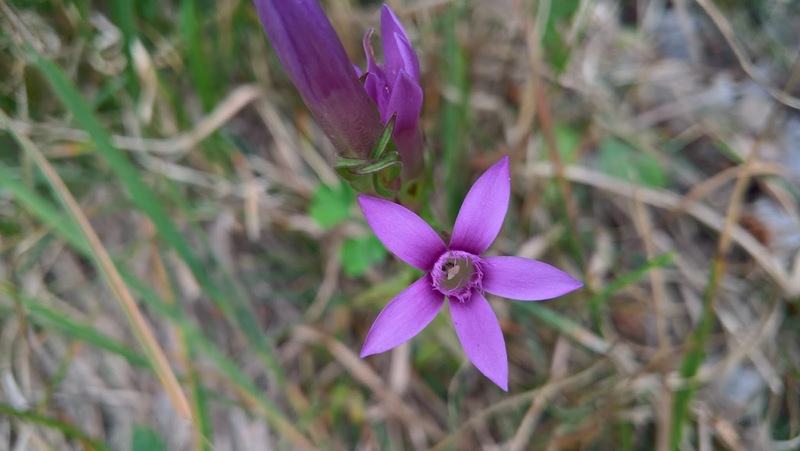 Right: Gentianella sp. 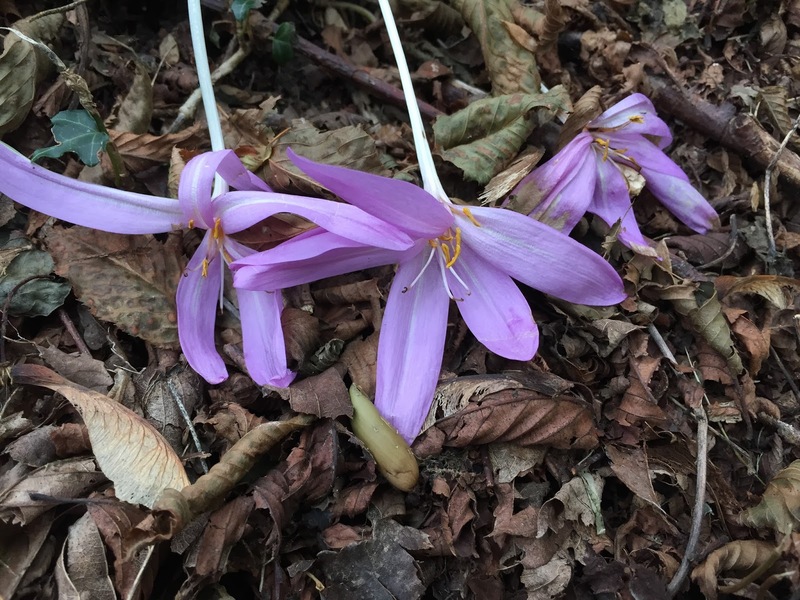 Left: Crocus sp. 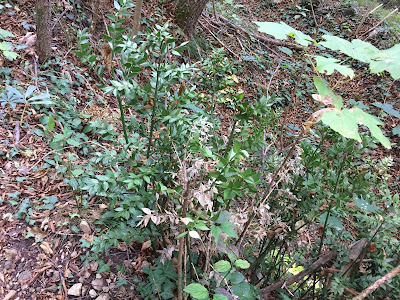 Center: Ruscus aculeatus, Pungitoppo. 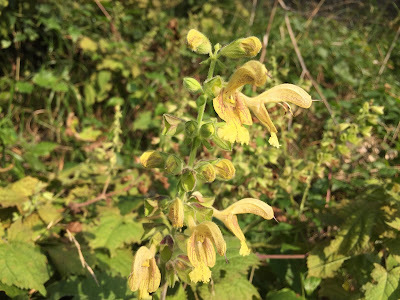 Right: Salvia glutinosa. 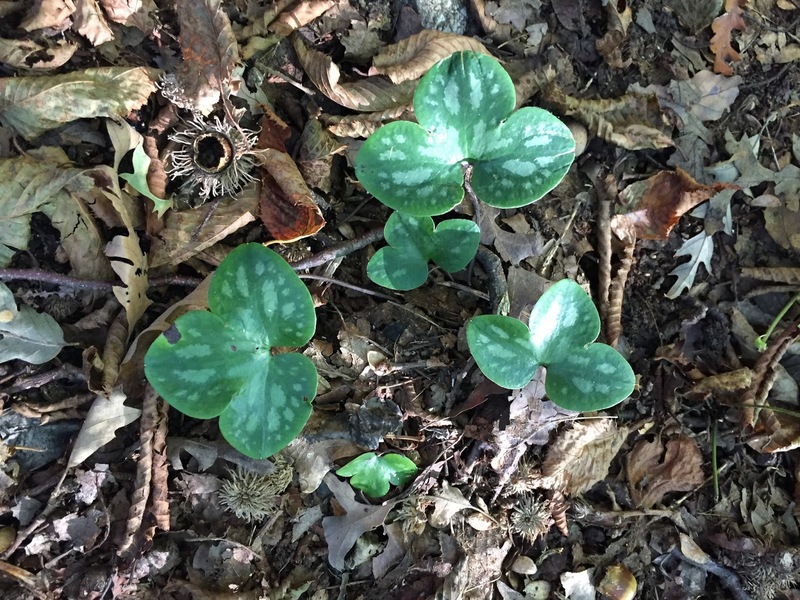 Different leaf patterns. Left: Hepatica nobilis leaves. 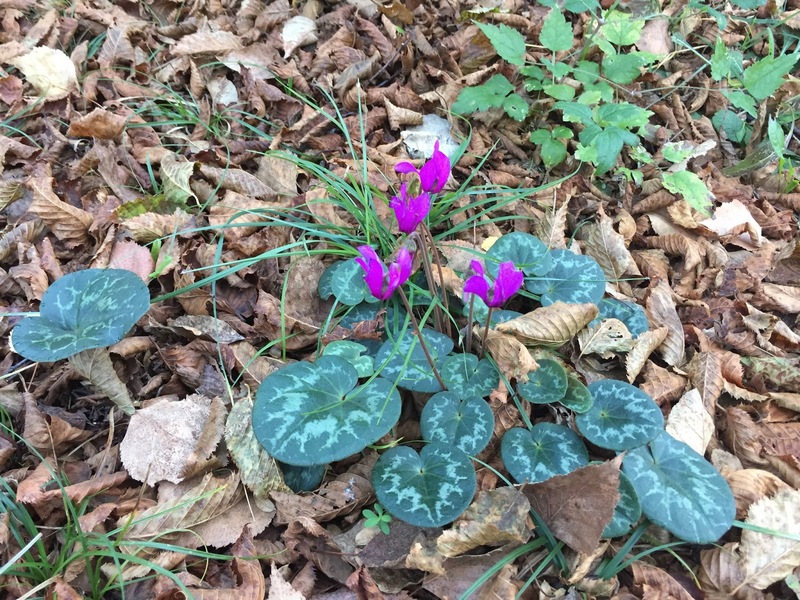 Center: Cyclamen leaves. Right: Pulmonaria leaves. Left: A roccolo above Bracca. 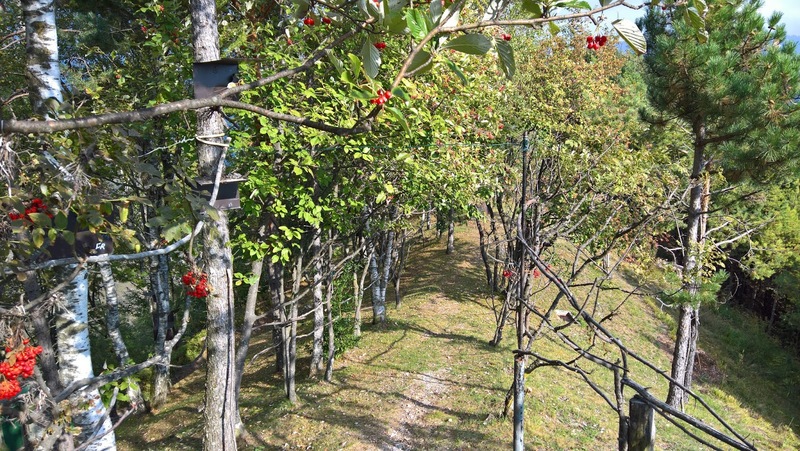 Right: A bird cage with live birds. 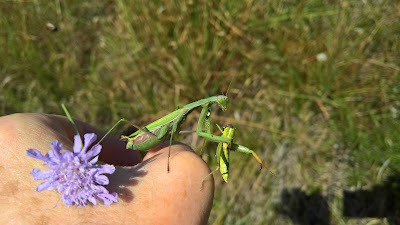 A praying mantis eating lunch. Uh, oh, looks like it was another mantis. 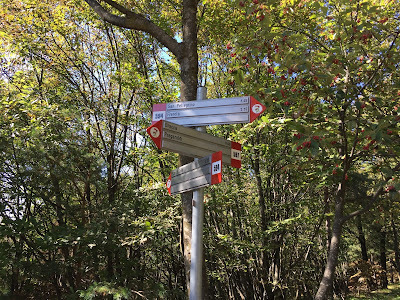 Left: Start of the trail (furthest south) is under SS470. 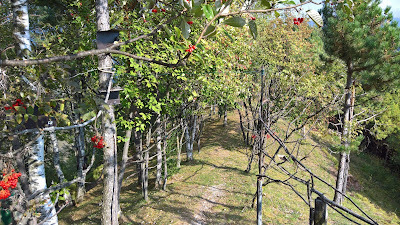 Center: Start of walk in the shadow of the hill. Right: Finally some sun as we reach Sottoripa. 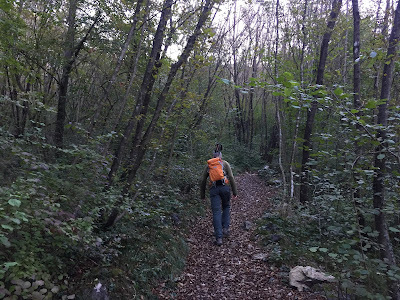 Left: Sentiero 594 just under Pizzo di Spino. Center: The last scramble up on to Pizzo di Spino. 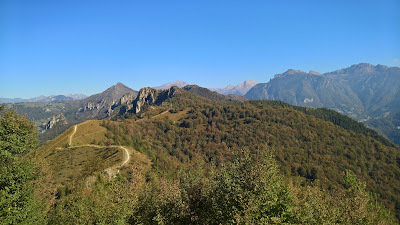 Below view of Val Brembana (San Pellegrino). Right: Rock with painted trail indication at Pizzo di Spino. 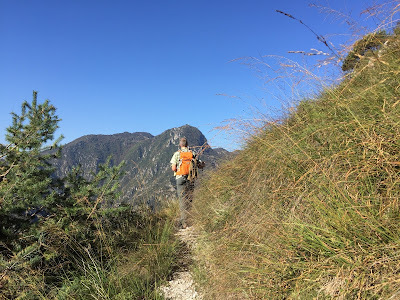 Left: Walking north from Pizzo di Spino. 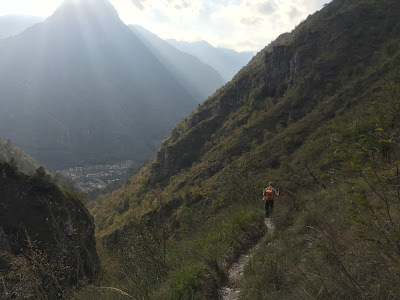 Center: Descending Sentiero 594 toward San Pellegrino. 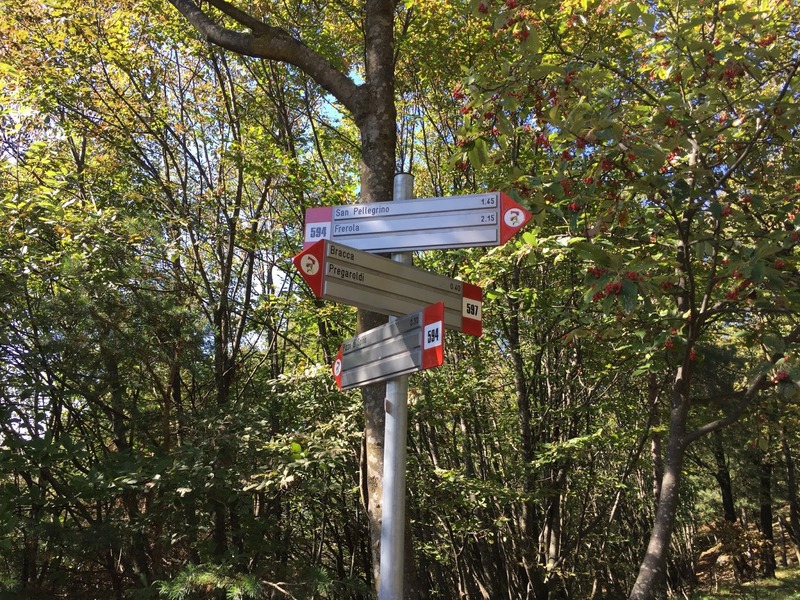 Right: Sign at intersection of trails 594 and 597.